Diamonds are among nature’s most precious and beautiful creations. This hardest gem of all is made of just one element: carbon. Diamond forms under high temperature and pressure conditions that exist only about 100 miles beneath the earth’s surface. Diamonds are valued for their colorless nature and purity. Most diamonds are primeval—over a billion years old—and form deep within the earth Few consumer products undergo the scrutiny that diamonds are subjected to. That’s because subtle variations in color, cut and clarity can cause significant differences in a diamond’s value. Clarity grades assess the number, size, relief, and position of inclusions and blemishes The less color, the higher the grade. Even the slightest hint can make a dramatic difference in value. Cut (proportions, symmetry, and polish) is a measure of how a diamond’s facets interact with light Rarity means larger diamonds of the same quality are worth more per carat. - FL (Flawless) - No external marks or internal inclusions visible to a trained eye under 10x magnification. - IF (Internally Flawless) - Only minor surface blemishes but no internal inclusions visible to a trained eye under 10x magnification. - VVS1, VVS2 (Very, Very Slightly Included) - Few, very small inclusions and/or finish faults, difficult for a trained eye to see under 10x magnification. Typical flaws include tiny pinpoints, faint clouds, tiny feathers, or internal graining. - VS1, VS2 (Very Slightly Included) - Very small inclusions and/or finish faults, somewhat difficult for a trained eye to see under 10x magnification. Typical flaws include crystals, feathers, distinct clouds and groupings of pinpoints. - SI1, SI2 (Slightly Included) - Small inclusions and/or surface blemishes easily seen under 10x magnification, but not visible to the naked eye (with SI2, slight flaws may be eye-visible to the trained eye, but virtually impossible to see to the untrained eye). Typical flaws include crystals, clouds and feathers. - I1 (Imperfect 1) - Inclusions and/or finish faults visible under 10x magnification, but hard to see with the naked eye. Little effect on the brilliancy of a stone, depending on cut quality. - I2 (Imperfect 2) - More inclusions and surface blemishes visible without 10x magnification. Possible slight diminished brilliancy within stone, depending on cut quality. - I3 (Imperfect 3) - Many and/or large inclusions and surface faults clearly visible without 10x magnification. Slight diminished brilliancy within stone, depending on cut quality. While cut does include shape, in terms of the 4 Cs it refers to the proportions of the cut. 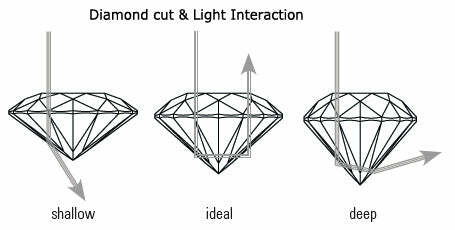 A diamond’s cut grade is an objective measure of a diamond’s light performance, or the amount of sparkle a diamond has. A diamond’s overall proportions, as well as the size and position of its facets, make up the cut. The consistency and balance of these can greatly affect how the stone captures light and reflects it back to the eye. When a diamond is cut with the proper proportions, light enters the diamond and is returned through the top of the diamond. If a diamond is too shallow, light will escape from the bottom of the stone. If it is cut too deep, light will escape out the sides. Studies have been conducted to find the optimum proportions of a diamond’s cut so that it has the greatest amount of sparkle. If its cut falls within these parameters, it is considered an ideal cut. Diamonds with fine proportions, symmetry and polish optimize their interaction with light and have increased brilliance, dispersion, and scintillation. A diamond certification, also known as a diamond report is an independent quality report on a specific diamond. It is issued by an accredited gemological laboratory with no affiliation to any retail outlet, giving the consumer a completely objective opinion on the diamond’s quality. The certification includes the measurements, proportions, color grade, clarity grade, cut grade and carat weight of the diamond. It also includes specifics that most jewelers do not have the equipment or the knowledge to determine, such as the diamond’s fluorescence, polish, symmetry, and also a graphical depiction of the diamond showing the location of the diamond’s inclusions. Each certification has it’s own number, the date which it was analyzed and a plotting of the diamond which shows the internal and external characteristics of the diamond. The leading diamond laboratories in the world are the Gemological Institute of America (G.I.A.) and the European Gemological Laboratory (E.G.L.) Any diamond can be certified by either laboratory for a fee. It is also important to mention that the G.I.A standards are more strict than the E.G.L. A certification is the only way to provide a completely objective report on your diamond that will stand the test of time. • EGL USA (European Gemological Laboratory) - main office opened in 1977 in the diamond district in New York and has established a reputation of fast turnaround time and fair grading standards. The primary difference between the above laboratories is their grading standards; in general, the GIA is more strict than the EGL. There are also other labs that certify diamonds and their grading standards may vary. 1. You will know exactly what you are buying. Every important factor you need to know about the diamond is described in the report. 2. You will get an assessment of the diamond's characteristics based on global standards eliminating any misunderstandings in the future. 5. Purchasing a certified diamond will simply provide you with much more confidence and value. - Diamond Grading, Gemological Institute of America (GIA), The Basics of Jewelry by Stuller 2012.